For the freedom you enjoyed yesterday... 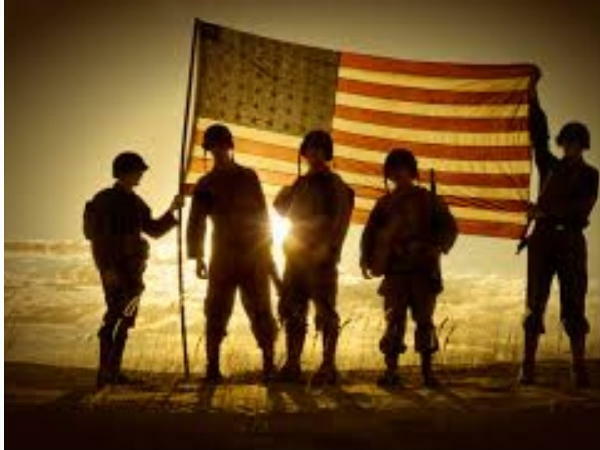 Thank the Veterans who served in The United States Armed Forces. Looking forward to tomorrow's freedom? Support The United States Armed Forces Today! Sgt. 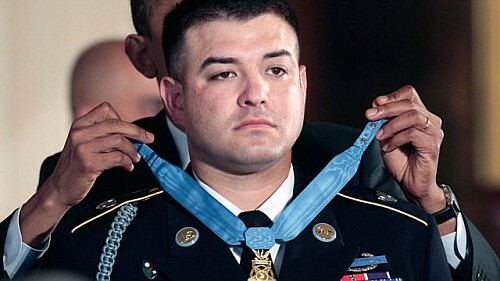 1st Class Leroy Petry, who had the Medal of Honor placed around his neck July 12, 2011, by the president of the United States, recounted the moment after his hand was taken from him by a grenade during a May 26, 2008, combat operation in Afghanistan. "It was vivid -- where I could see the black marks from where the burns were. And a little bit of the dirt and the smell of explosives. I sat up and I grabbed it. And it's a little strange," Petry said. "But this is what was in my mind: 'Why isn'tthis thing spraying off into the wind like in Hollywood?'" After that, the seasoned Army Ranger -- who was at the time on his seventh deployment in support of combat operations both in Iraq and Afghanistan -- had to take charge of his own situation, and of the young Soldiers whom he led. At the time of his actions in Afghanistan, Petry was assigned to Company D, 2nd Battalion, 75th Ranger Regiment out of Joint Base Lewis-McChord, Wash. Petry's actions came as part of a rare daylight raid to capture a high-value target. "It's a little out of the norm," Petry said, of conducting such a mission with the sun over their head. "It's never a good thing. We don't like to because our odds are a little lower. But just like any other mission, we said we're going to go out there and do what we do. Execute the mission." Petry's Ranger unit, he said, runs roughly 400 missions during a four-month deployment. "You can see two missions in one night," he said. "That's how busy the ops tempo is. We go out and come back in and then -- hey, wait, there's something else, go back out. OK. Drive on." During his last mission, Petry was to locate himself with the platoon headquarters in the target building once it was secured. There, he was to serve as the senior noncommissioned officer at the site for the remainder of the operation. But things quickly got dangerous for Petry and his team. Insurgents opened fire on Petry and his men. Petry had fellow Ranger Pvt. 1st Class Lucas Robinson at his side. The two were to clear the outer courtyard of the target building. It was there the two first saw the enemy. "I remember seeing the guy out of my peripheral vision," Petry said. "Two guys with AKs at their hip, just spraying. And one happened to strike me right in the thighs. I didn't know I was hit in both thighs, but it hit my left thigh." Robinson was also hit, Petry said. "He was struck right in his ribcage on his left side and he continued along and followed behind me." While wounded and under enemy fire, Petry led Robinson to the cover of a chicken coop in the courtyard. The enemy continued to deliver fire at the two Soldiers. Petry reported contact was made with the enemy, and as a result, team member Sgt. Daniel Higgins moved to the outer courtyard. As Higgins moved toward the chicken coop to meet with the two wounded Soldiers, Petry threw a thermobaric grenade toward the enemy. That explosion caused a lull in enemy fire. As Higgins evaluated the wounds of both Petry and Robinsion, an insurgent threw a grenade over the chicken coop. The grenade landed about 10 meters from the three Rangers, knocked them to the ground, and wounded Higgins and Robinson. With three Soldiers taking cover in the coop, an insurgent threw yet another grenade. This time, the grenade landed just a few feet from the three Soldiers -- much closer than the earlier grenade. "It was almost instinct -- off training," Petry said of his response to the situation. "It was probably going to kill all three of us. I had time to visually see the hand grenade. And I figure it's got about a four-and-half second fuse, depending on how long it has been in the elements and the weather and everything and how long the pin has been pulled. I figure if you have time to see it you have time to kick it, throw it, just get it out there." That's when Petry picked up the grenade and threw it away from him and his buddies. As it turns out, he did have the time to save all three of their lives -- but not time to save his hand. "I actually didn't think it was going to go off," Petry said. "I didn't really feel much pain. I didn't know it had gone off and taken my hand until I sat back up and saw it was completely amputated at the wrist." "The younger guys next to me were kind of still in shock and awe," Petry said, and he tasked himself do what it is that makes Americans marvel at their Soldiers. "Maintaining control, maintaining awareness, trying to remain calm -- so they stay calm." He radioed for help -- but the fighting wasn't over. Staff Sgt. James Roberts engaged the enemy and was able to suppress their fire. 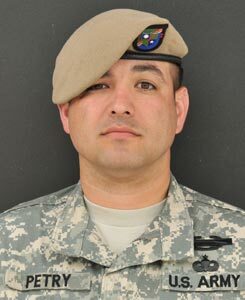 But another insurgent began firing, and fatally wounded Spc. Christopher Gathercole. Higgins and Robinson returned fire and killed the enemy. Moments later, Sgt. 1st Class Jerod Staidle, the platoon sergeant, and Spc. Gary Depriest, the platoon medic, arrived in the outer courtyard. After directing Depriest to treat Gathercole, Staidle moved to Petry' s position. Staidle and Higgins then assisted Petry as he moved to the casualty collection point. While passing through hospitals back to the United States, doctors had operated to remove damaged or dead tissue from Petry's arm, in part, to prevent infection. But when he arrived stateside his wound was still open, the bone was still exposed and it was wrapped with gauze. "The initial surgery when he came in was to basically take away what damaged tissue was left, and close his skin," said Col. James Ficke, an orthopedic surgeon. "He had enough skin, but no functioning hand ... by the time he got to us. When he looked at his hand at the time of his wound, when he put the tourniquet on, he had tissue -- skin and broken bones. But no fingers or anything." Ficke is Petry's doctor, and also serves as the current chairman of the Department of Orthopedics and Rehabilitation at Brooke Army Medical Center in San Antonio. He also became a friend with Petry. "We met when he was evacuated back to Brooke AMC," Ficke said. "I was on call when he came in to the hospital. He was brought in with a group of patients who were injured in Afghanistan." While it was by chance that Petry landed in Ficke's hospital while he was on duty, the doctor admits he kind of knew Petry was coming. Ficke and Petry's commander had served together in Iraq. "He emailed me and said to look out for him," Ficke said. "I knew that Sergeant Petry was going to be one of the guys who I was going to have a relationship with for a long time." Petry was in his late 20s at the time he was wounded and Ficke said it was devastating for a young man -- in the prime of his life -- to suffer such a catastrophic wound. "This is a guy who was a very active guy, a Ranger," Ficke said. "He had just come back from Afghanistan -- evacuated out. But a week before that, in the prime of health, fighting over there with his buddies." From the beginning though, Ficke said Petry was gunning to get back to the fight. "He wanted to stay in the Army, very much," he said. "He wanted to deploy again, he wanted to restore his life as much as he could. We talked a lot about what was possible and what we could help him with." Petry said he drew inspiration from those around him in the hospital -- from fellow Soldiers with severe burns and "phenomenal attitudes," to those with injuries similar to his own. "The first person that came and visited me in the hospital was a female," Petry said. "She was a double-amputee above the elbow. She had the greatest attitude. She was hanging out with the guys, having a great time. To see that kind of reaction, I thought I have nothing to complain about." Ficke said that he was able to close Petry's wound over his wrist, so the Ranger had available a functioning wrist that could provide rotation. Ideally, a prosthetic hand would fit over that and he would use his own wrist to rotate the hand. But his own wrist was not as capable as it could have been, Ficke said. "Sometimes his own ability to turn that wrist would not be as good as some of the prosthesis," Ficke said. "He and I and the prosthetist, all kind of talked and decided to have a shorter forearm and take away that wrist so that he could have a prosthesis that would do that with motors." Removing a living part of his body to replace it with a more capable mechanical equivalent might be a tough choice -- but Petry said he's pleased with the results. "It's a great hand," Petry said. "It's got a couple of sensors built in underneath the casting right above the skin. What'll happen is, every muscle contraction you make will send signals up to the hand. Each finger, when it meets resistance, it will stop. So you got more dexterity to grab round shapes and stuff like that and this particular hand is able to have a couple of other modes, where you can pinch and so a grasp." Petry's prosthetist built a fitting to slide over Petry's forearm so the hand can attach, and also placed sensors to pick up electrical signals from his muscles. After working with a therapist, Petry's robotic hand moves with the very signals he used to use to control his own hand. "Occupational therapy was great," he said. The therapist had Petry practice doing exercises, manipulating small objects so he could learn dexterity in his new hand. "I used it everywhere," he said. "Actually, I got myself into trouble with recovery -- I wore the arm too long and didn't let my limb get used to it and so I swelled up and I couldn't wear it for a couple days." Now Petry is pretty adept with his new robotic hand -- and is using it back home with his family, and as he moves throughout the Army meeting new people who are interested in his story. "I could shake people's hands today. I'm meeting people all the time. It feels great to actually shake their hands with my right hand," he said. "I'm fortunate they have this type of medical technology. I thought I was going to end up with a set of hooks -- and I got those as well. But when they handed me a prosthetic hand that functions pretty darn close to a real thing, I was ecstatic." Petry was injured in May 2008, and didn't actually make it home permanently until April 2009 -- a span of more than 10 months. It was two things, Petry said, that he thought about as he healed -- and that drove him to push through the therapy so he could get back to the people he wanted to be around. "My family, and my second family -- the 2nd Ranger Battalion," he said. "I used to joke with my wife. I used to tell her hey I got my Alpha and Bravo team leaders at work. And you're my Charlie team leader. We're all one big happy family. I really wanted to get back and see the guys. I really miss the unit, the camaraderie, the high spirit. And to keep doing what I can for the Army." Petry's got more than himself and his fellow Rangers to concern himself with. Like a lot of Soldiers, he's got a wife and kids that worry about him while he battles for freedom in Afghanistan. Petry and his wife Ashley have four children: Brittany, Austin, Reagan and Landon. Ashley first heard about her husband's wounds when some Soldiers came to their front door -- a day her mother was visiting to help with the kids. "It was Memorial Day morning and the kids were out of school," she said. "We'd slept in late and my mom was in town -- she comes in often when he deploys. I was still in pajamas. The doorbell rang -- and we've always been briefed as spouses if they come to your door what they would be dressed in and how many would be there if there was a casualty." She said she knew by the way the Soldiers were dressed -- and how many of them there were -- that Petry had not been killed. But she knew something was wrong. "I looked through the peep hole and you see the tan berets and the uniform -- my heart just sank," she said. "I just remember being numb. And after that morning I always was very sad and would cry when I'd see things on TV when other families lost their family members overseas, but now I have that feeling." Less than a week later, Ashley and the kids could meet up with Petry -- the first time they'd seen him since he'd deployed. "I think the acceptance came when we were actually able to bring the kids to Texas and they could see him," Ashley said. Initially concerned about their youngest, Ashley said she didn't know what to expect when the boy would see his dad for the first time without an arm. "But he ran straight to him. And from day one, he's had a nickname for it -- that's Nubby. He calls it Nubby," she said. The boy refers to his dad's shortened forearm -- his stump -- by a nickname. "Even when I'm gone on the road, I'll call late at night and tell him goodnight," Petry said. "He'll say tell Nubby goodnight for me." Both Petry and his wife say he's made some changes at home -- but has otherwise adjusted to life with his new mechanical hand. Ashley, initially concerned Petry would need assistance with everyday tasks, said he has turned down offers of help. Instead, he's become skilled doing all the things other Soldiers do for themselves -- but with one mechanical hand. "From the day I went to the hospital, he was doing everything himself," she said. That included such things as shaving and cutting his fingernails. "He didn't want help. At home we don't see him as injured. He sometimes forgets he has the prosthetic." Petry even shakes hands with new people using his prosthetic -- something others might be uncomfortable with, but something he said he is proud of. 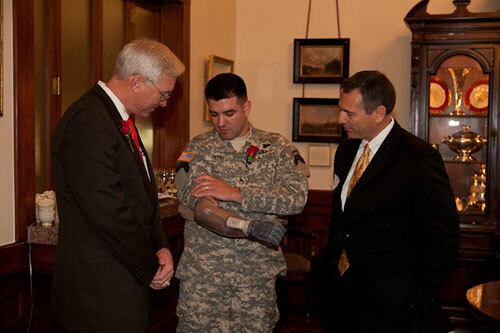 On a March trip to Washington, D.C., he got to use his new hand to greet Army leaders. Despite some adjustments which Petry said do in fact require him to ask his family for help, and which he said means he gets more interaction with his kids -- he has actually learned to do some things with his prosthetic that he didn't do before. "I picked up golf with my golf attachment," he said. Petry's been a Ranger since after basic training. And he wasn't the first in his family to do so. "My cousin was actually serving in the 2nd Ranger Battalion when I was finishing up high school, debating on when or what I was going to do," he said. "He explained a lot to me what the regiment did, and that was a sell for me." Petry said after being sold on the Rangers by his cousin, he had made up his mind to follow in his footsteps. After completion of One Station Unit Training, the Basic Airborne Course and the Ranger Assessment and Selection Program -- all at Fort Benning, Ga. -- Petry got assigned to 2nd Battalion, 75th Ranger Regiment. Today, Petry holds his unit, and his Ranger team members in high esteem. "They're my Ranger brothers," he said. "They're great guys, all of them. And they are definitely guys you'd want to be at the front lines with. I'm glad they were there that day with me." Petry said he has honored his fellow fallen Rangers -- the ones he calls real heroes -- by keeping their names as close to him as possible. "I've got all the names of the 2/75 Rangers we've lost on my prosthetic arm," he said. "As much as I like to say remember the fallen heroes, those are the true heroes, who sacrificed it all. I didn't sacrifice anything more than anyone else who is out there." Included among those recipients are Spc. Ross A. McGinnis, Sgt. 1st Class Paul R. Smith, Petty Officer 2nd Class Michael A. Monsoor, and Marine Corps Cpl. Jason L. Dunham, all for actions in Iraq. Staff Sgt. Salvatore Giunta, Staff Sgt. Robert Miller, Sgt. 1st Class Jared C. Monti and Navy Lt. Michael P. Murphy were awarded the Medal of Honor for actions in Afghanistan. Please remember the Canteen is here to honor, support and entertain our troops and their families. This is a politics-free zone! Thanks for helping us in our mission! Whenever she was unable to take my phone call, my friends voicemail recording invited me to leave her a message. The recording cheerfully concluded, Make it a great day! As I reflected on her words, I realized that its not within our power to make every day greatsome circumstances truly are devastating. But a closer look might reveal something redeeming and beautiful in my day, whether things are going well or poorly. Habakkuk wasnt experiencing easy circumstances. As a prophet, God had shown him coming days when none of the crops or livestockon which Gods people dependedwould be fruitful (3:17). 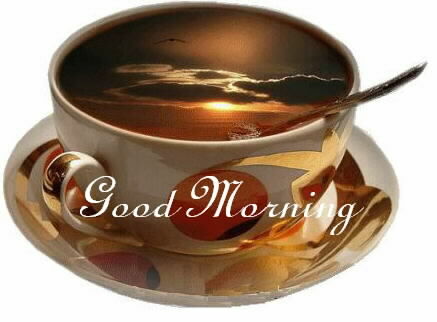 It would take more than mere optimism to endure the coming hardships. As a people group, Israel would be in extreme poverty. 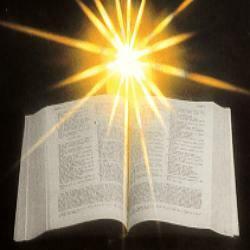 Habakkuk experienced heart-pounding, lip-quivering, leg-trembling fear (v. 16). Yet despite that, Habakkuk said he would rejoice in the Lord and be joyful (v. 18). He proclaimed His hope in the God who provides the strength to walk in difficult places (v. 19). Sometimes we go through seasons of deep pain and hardship. But no matter what weve lost, or wanted but never had, we can, like Habakkuk, rejoice in our relationship with a loving God. Even when it feels like we have nothing else, He will never fail or abandon us (Hebrews 13:5). He, the One who provide[s] for those who grieve, is our ultimate reason for joy (Isaiah 61:3). The Lord helped me to finance a move for a new job. Without his help and guidance, this ,one would have been impossible. He guided me in the right direction to find the funds. And also intervene in a way that helped us get 1/2 off first months rent. Without that, I would have been devastated financially. Top of the even’in to you! Keep up the good work on recovering! Thanks for honoring tonight's Hero, Kathy! 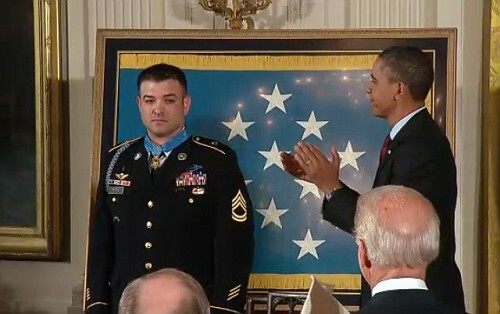 SFC Petry is a true All-American patriot! Good evening, CMS...have a great week. Good evening, lightman...are you ready for spring later this week? Is your bad weather gone? I will. I hope you have a great week as well. Might get a dusting (the “onion snow”) overnight but the serious snow season appears to be over...I hope. The first days of March were rough with a trifecta of storms...fortunately all of them “underacheivers”. He will and does provide. You have been blessed! Yes, I have visited my shop a few times, no work just advising and directing. I do a lot just thru text message and pictures. In first....The Mayor grabs the gold!! And in second....CMS snags the silver! !